Developing and developed countries reached a stalemate over how to verify carbon emissions from forests in Saturday's talks on reducing carbon emissions from deforestation at the annual U.N. climate conference in Doha, Qatar. In essence, it reflects the proverbial chicken-and-egg dilemma: A wealthy donor country like Norway is reluctant to fund projects under the REDD+ mechanism if the verified carbon emissions are not completed to high standards. And poor, forested countries like many in the Group of 77 -- a U.N. coalition of less-developed countries -- are unwilling to take steps to verify to a high standard if they don't have any funding from donors or markets. "We can't discuss money until we agree on verification; we can't discuss verification if there's no money on table," said Bruce Cabarle, leader of the forest and climate initiative for the World Wildlife Fund. Clearing forests to make way for agriculture and other uses is responsible for about 20 percent of the world's greenhouse gas emissions. Fossil fuel-rich Norway has committed $1 billion to curb deforestation in the Amazon and $1 billion for Indonesia. Although improvements have been seen in the Amazon -- Brazil recently announced a 27 percent drop in the rate of deforestation in just one year -- advancement in Indonesia has been rocky. As part of its deal with Norway, the country initiated a two-year moratorium on clearing land in January 2011. Since, several accounts of land clearing have been reported by the media and environmental organizations, many by palm oil companies eager to expand their plantations. Because a decision was not reached, the SBSTA punted the issue to the next U.N. Conference of the Parties to the U.N. Framework Convention on Climate Change (UNFCCC) 12 months from now. Observers from different policy groups disagreed on who was responsible for the breakdown in negotiations. Kate Dooley, an analyst with the European forest policy group FERN, criticized Norwegians for pushing conditions on funding. Past climate conferences have yielded almost no commitments on funding from wealthy countries, she said. "Rich countries are shirking any of their responsibilities to provide financial support and are placing increasingly onerous requirements on developing countries regarding [measurement, reporting and verification]," Dooley said. This would lead to a scenario in which poor, tropical forest countries would need to submit to a more rigorous review process for forest carbon than what wealthy countries use to measure progress toward reducing their own carbon emissions from fossil fuel use. Contrary to FERN's position, the Tropical Forests Group (TFG) blamed Brazil for being too bullish in blocking high standards for verification. "Donor nations sent the signal loud and clear that finance to save forests would require verification. Catastrophically for our planet, Brazil refused to listen," said Culley Thomas of TFG, a California-based organization that favors private market mechanisms to fund REDD+. More stringent verification of REDD+ carbon savings is preferred by pro-market groups, which believe the verification would bring more investor confidence in buying and selling carbon offsets. The impasse over verification, the "V" in the measurement, reporting and verification part of the REDD+ mechanism, known as MRV, happened as the SBSTA meeting was nearing its end. It marked a sour ending for a session that had earlier on made significant progress on other REDD+ issues, including an agreement on linking MRV activities to reference levels, or a country's rate of deforestation in a "business as usual" scenario. "We had a colossal breakdown in communications," said Cabarle, who called the breakdown a tragedy. "If the issue of verification was going to be so important to the Norwegians, I think the message was not received beforehand by the developing countries." "All the good work was held hostage over these two issues," he added. Further discussions on finance will be carried out in the Ad-Hoc Working Group on Long-term Cooperative Action (LCA) this week, where the lack of movement on MRV is likely to stall options on how to pay for REDD+. The LCA track at the annual climate conferences will dissolve at the end of the year to make way for the Durban Platform, decided at last year's conference in South Africa. Delegates are scrambling to finish as much work as possible on REDD+ in the LCA track to transfer it to the Durban Platform. "I think that the unknown is really putting a lot more stress on these negotiations, with the sunset clause staring everything in the face," Cabarle said. In an informal discussion in the LCA, a delegation led by Tanzania proposed to include a system to measure non-carbon co-benefits to REDD+, like increases in biological diversity. This would motivate countries in which forests do not hold a lot of carbon -- like many dry forests in sub-Saharan Africa -- but conservation measures still reap benefits like species protection, said Stephen Leonard of the Climate Justice Program. "A door is open concerning co-benefits," Leonard said. 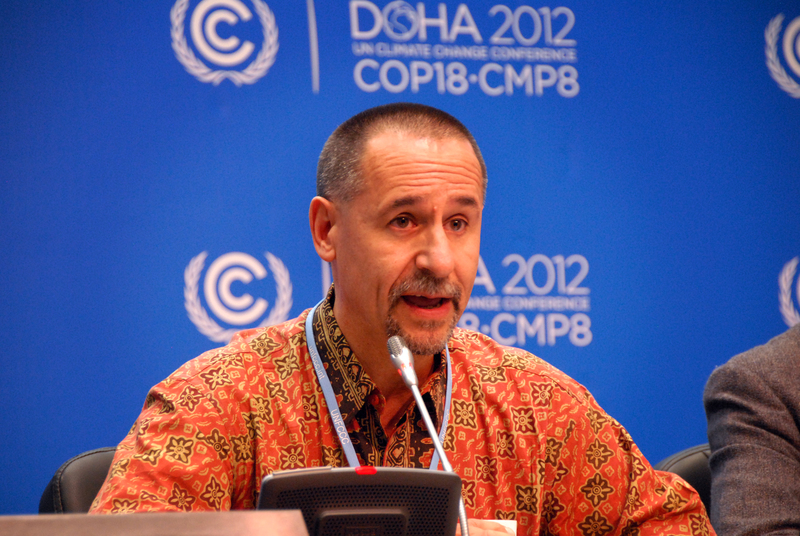 Australia argued that discussions within the UNFCCC should remain focused on carbon benefits. Papua New Guinea proposed to create an institution within the UNFCCC that would deal specifically with REDD+, gathering the work spread out across all other institutions into one. The United States said this was not the time to create new institutions. Discussions will continue at this week's LCA meeting. 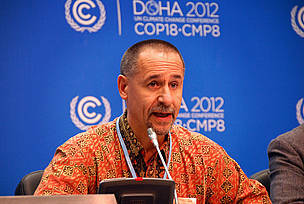 Bruce Cabarle at the COICA side event, UNFCCC-COP18.